More than 105,000 polling stations have been set up for the elections [Willy Kurniawan/Reuters] Jakarta, Indonesia - More than 190 million Indonesians go to the polls on Wednesday to choose their next president after a polarising election campaign that has focussed on ideologies rather than policies. The presidential race pits incumbent Joko 'Jokowi' Widodo and his running mate, Indonesian Ulama Council Chairman Ma'ruf Amin, against retired general and longtime rival Prabowo Subianto and multi-millionaire businessman Sandiaga Uno.Widodo and Amin are trying to project themselves as progressive yet religious, with a campaign slogan of "Advancing Indonesia". "I am a nationalist," Widodo said on the announcement of his candidacy in August 2018. "He is a devout religious figure. We complement each other well. "Prabowo, who has been accused of human rights abuses, ran against Widodo in 2014, while Uno is a businessman who spent a few months as deputy governor of Jakarta, after the mass rallies against Basuki Tjajaha Purnama (also known as Ahok) who was accused - and later convicted - of blasphemy. The latest opinion polls in the lead-up to the election have Widodo-Amin leading by as many as 20 points, with a significant proportion of undecided voters. Most political experts predict a closer result, however, given that 2014's pre-election polls were similar, but Widodo ultimately beat Prabowo by just six points. Both sets Prabowo and his supporters have said they will protest in the streets "if the vote is stolen" from them. Some supporters have also been accusing the Widodo camp of voter fraud, claiming they are registering foreign voters and using fake voter lists. 190415060854971Social media is helping fuel such conspiracies, with tension between each set of the supporters running high. On Twitter, Widodo supporters are referred to with derision as cebong (tadpoles), and Prabowo fans dismissed as kampret (bats). "At least two pieces of fake news are widely believed by Prabowo supporters," said Andreas Harsono, Indonesian Researcher at Human Rights Watch. "One is that they believe there are many mainland Chinese workers in Indonesia, even though this has been repeatedly debunked. Expatriates in Indonesia make up just 0.06 percent of the workforce, but Prabowo's camp argue that there are millions of Chinese workers. "The second is that they believe Jokowi is anti-Islam. They believe he is a good Muslim and a good grandfather, but they believe he is anti-Islam. "These hoaxes will be very influential on many voters.
" "If it's zero-one [referring to Widodo's party number on the ballot paper], we know his track record. 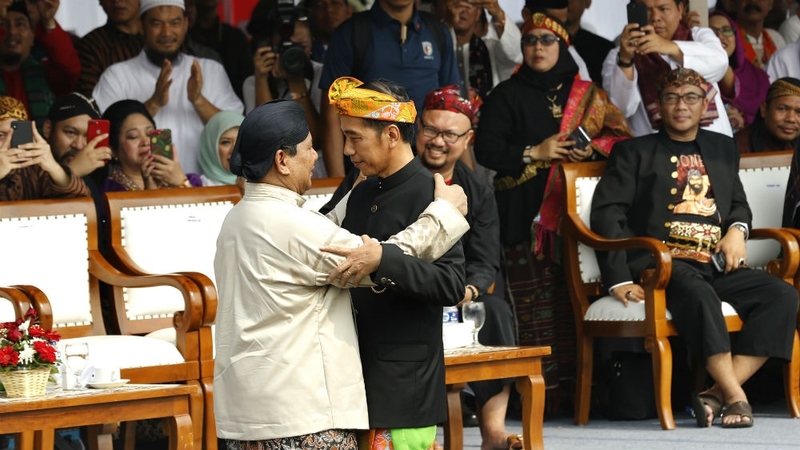 The other guy we're not so sure, he looks like he's flip-flopping, I'm not really sure about him," said Jeffrey Sidero, a Widodo supporter:Both Widodo and Prabowo are courting the Muslim vote. Widodo's running mate is a well-known conservative voice and part of Nahdlatul Ulama, Indonesia's largest Islamic organisation.